This illustration is for chapter 1 of the Notable Missourian book on Emmett Kelly (Written by Donald McManus, published by Truman State University Press). Here young Emmett is shown fascinated with a vaudeville troupe disembarking for a performance in his childhood hometown of Cabool Missouri. Back in those days (late 19th, early 20th century) traveling vaudeville acts were an incredibly popular form of entertainment and nearly every town big and small had a theatre where the entertainers could perform. Here's a sample of a comp sketch from the Notable Missourian (Truman State University Press) story on Joseph Kinney, a steamboat builder/operator in Missouri during the mid 1800s. During the civil war many of the railroad bridges over the Missouri RIver were destroyed. 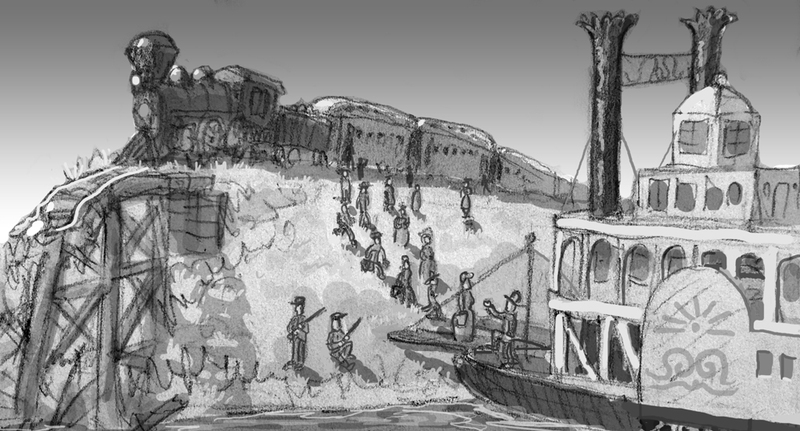 Joseph Kinney's steamboats would be used to get the train passengers and freight across the river to a location where the railroad could pick them up again. This is one of several composition ideas for this chapter and may not be used.